Academically trained in German language and literature at Colby (BA), Tufts (MA), and Harvard (ABD), Maria Luisa Arroyo (www.marialuisaarroyo.com) is an educator, a single parent, a 2004 Massachusetts Cultural Council poetry grant recipient, a 2008 Massachusetts Unsung Heroine, a visual artist, and a self-taught poet. 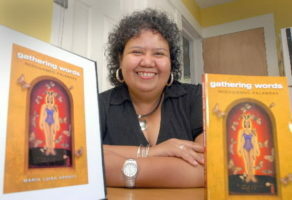 Her collections of poems include Gathering Words/Recogiendo Palabras (Bilingual Press, Tempe, AZ: June 2008). The poem below appeared in her self-published chapbook, Touching and Naming the Roots of This Tree (2007). too plentiful too many to matter. had collapsed under thunder clouds. more real to them than the death of does. to warn drivers of turtles trying to cross. Far away, dark helmets or rounded tire scraps. its feet frantic for balance, for life. were the missing signs of warning, of danger.